You know the weather has been poor if I'm showing pictures of the moon on my blog instead of light curves or pictures of exploding cataclysmic variables. These were taken through high clouds on May 4th while I was cooling the CCD in preparation for a night of time series data on active CVs. It never did clear up enough to do photometry, but the moon is so bright you can see it through clouds with a 12 inch telescope. 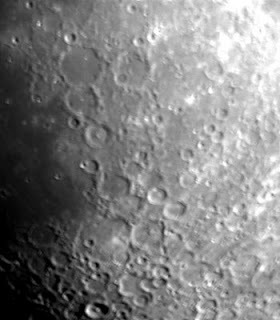 Prominent in the center of this image is the crater Plato. The floor of the crater has filled up with lava, obscuring the central peak and blotting out any old craterlets. The floor is smooth and dark and doesn't have many new small craters inside. The crater is roughly 1km deep and 109km across. Plato has been rumored to exhibit transient lunar phenomena in the past. Nothing unusual shows up in this image. Still, it is a prominent crater in a highly visible spot. If I had to name favorites Plato would be on my list of top 5 craters. Another famous major crater on the moon is Copernicus. Unlike Plato, Copernicus has not been filled in by lava. It is 3km deep and 93km across. It has three central peaks, towering up to 1.2 km over the rough floor of the crater. One of the more prominent features is the massive ray system emanating from the crater. They are particularly noticeable during full moon. They extend out 800 kilometers from the crater, crossing older craters and surrounding plains. To the left is one of the more photogenic regions of the moon. 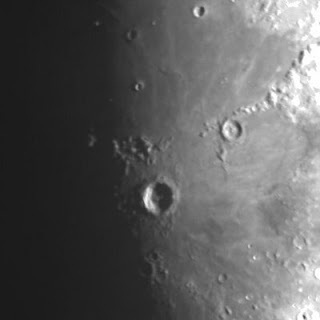 The three large craters to the upper left from top to bottom are- Ptolemaeus, Alphonsus and Arzachet. Down and to the left of this trio is the large flat Mare Nubium. Below and lower right of Mare Nubium is a crater filled region. The two largest craters in this image are Deslanders and Walter. Deslanders is 256km across, but its depth is not well known. This last image is of the south polar highlands region. 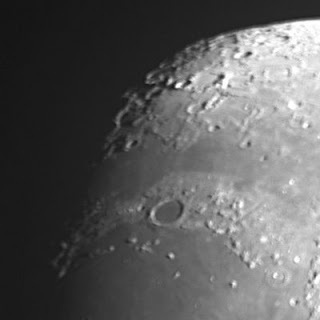 The large crater impeding into the shadows is Maginus. Maginus is an old crater and has several good sized impact craters inside its walls. 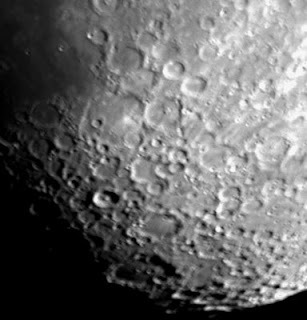 Tycho is the crater with the well-defined central peak in these last two images. Tycho is almost 5km deep and 85km across. The asteroid that created this impact crater shot ejecta up to 1,500km across the moon's surface. Simulation studies give a 70 percent probability that Tycho was created by a fragment from the same break-up that created asteroid 298 Baptistina. A larger asteroid from the same family may have been the impactor responsible for creating Chicxulub Crater on Earth 65 million years ago, and causing the extinction of the dinosaurs.